Every single one of us is incredibly fortunate. Our teams are full of smart, creative, and hardworking people. People passionately tackling the biggest challenges they can find. Without these amazing teammates, we would never be able to grow our businesses, serve our clients, or change the world. Our people are the lifeblood of our organizations. We trust them with everything we stand for. Maybe as leaders we think we do, but we don’t see the limitations we inadvertently create. 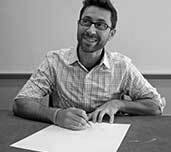 What if our people are stuck in a state of indecision, unable to move forward with confidence? What if we are overbearing, micromanaging, and controlling influencers who direct every action within our organizations? I don’t think we are that last one. At least, I hope we aren’t. I would like to think we all agree with the above statement about the people we choose to work alongside. I hope we trust their actions, give them the freedom and flexibility to act with autonomy and purpose, and allow them to be masters of their own destiny as much as they are masters of the shared destiny of the company. But so often, we fall short of giving our teams the necessary tools to work and live that way. We fail to support self-directed work: the kind we each find meaningful and intrinsically rewarding. Sometimes, we forget that those working with us may not have our same bias towards action, willingness to bend rules, or ability to sidestep processes — or we fear that our people embody far too much of these things. I have worked with a lot of organizations that wholeheartedly believe that their employees need to act with more empowerment — and where the employees wish to work in a more empowered way. Frequently, though, not enough is done to actually empower individuals to make sound and purposeful decisions. Few leaders set a framework to help their teammates know how and when to act, when to seek help, and when to share information or tasks with others. Several years ago, I created a simple matrix that became the foundation of my leadership style (see below). This is a quick and easy way to not just talk about empowerment with my team, but also to give them an actionable tool for understanding how to make their own decisions. The largest quadrant (in the bottom left) occupies the most prominent location because of its critical importance. 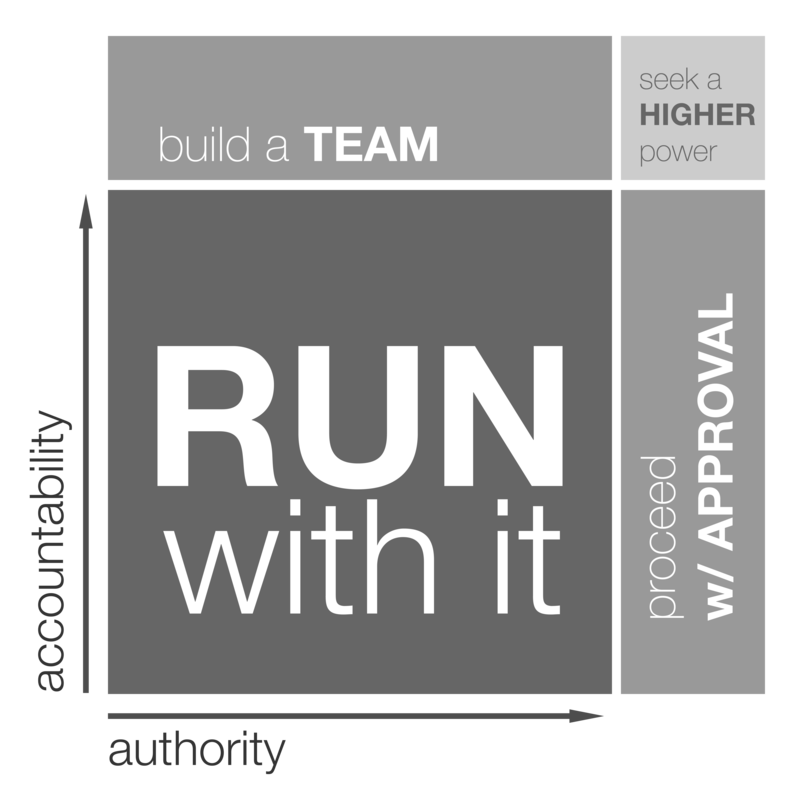 I like to label this quadrant “Run With It.” This represents the things your team should feel empowered to tackle at any time. These are the tasks or actions that an individual is both ready and willing to be fully accountable for and that don’t require anyone else’s approval. It is the largest quadrant because with the way our company operates, most of our team’s actions should fall into this category. A great “Run With It” example might come from a team member choosing to launch a new initiative within a team, learning a new skill, or going outside of normal job requirements to help a client. It could even mean organizing team lunches or meditation sessions. In a nutshell, it means getting things done and being willing to take responsibility for our actions regardless of the outcome. The quadrant in the upper left is labeled “Build a Team.” This represents a task or action that does not require any additional level of approval, however it is too large for any one team member to bear the sole responsibility. They need to share the accountability in order to get it done, and they need to build a team and get others involved. Process improvements make great examples of opportunities to “Build a Team.” Gathering consensus and participation from affected stakeholders is always necessary, but it becomes even more important if the outcome of a change in process impacts the duties of different individuals, departments, or business units. In this example, one person cannot move the needle without the support and coordination of the other parties. The third quadrant (in the lower right) is to “Proceed with Approval.” A team member will take responsibility to get it done, but first they need to get some level of organizational approval because it is outside of their authority to make the decision. In this situation, someone in the company will have an idea, and they will do whatever is required to get it done, but they first need to run it up the chain of command. We discard far too many ideas due to the fact that we think of them as someone else’s problem, or because we don’t feel empowered to make a change. Sometimes, the only empowerment needed is the willingness to take responsibility. Other times, it also requires the approval of managers or leaders. Examples of a time to “Proceed with Approval” might include making a decision regarding a large purchase or pursuing an idea with legal or contractual considerations. Ultimately however, proceeding down this path requires the willingness and ability to implement the idea once approved. The final quadrant is “Seek a Higher Power.” This does not mean we should “pray that the problem solves itself.” It does mean the issue at hand is too big for any one individual to own, and it is outside of their authority to make a decision. They have identified a problem, and ideally they have a potential solution. However, they need to run it up the chain of command, and if approved, another part of the organization will take responsibility for implementing it. Eventually, a team member will come across problems or propose ideas that are too large and complicated for them to take-on on their own. This could range from something as large as modifying a company-wide policy to something as acute as addressing an HR issue with a specific individual. The key to empowerment is to ensure all parties have a shared understanding of the expectations around how to make decisions. A tool like the one above is akin to a belief system. It’s a shared set of values that promotes action over inaction, and it sets the groundwork for when and how to pull back the reins. Share these guidelines with your team, use them yourself, or make your own, and then trust others to act within the framework. Empower those smart, creative, and hardworking people each of us sometimes takes for granted. Give them the power to find meaning in everything they do.